Flammenspuk is a word creation composed of the German words for flames and haunting. We share a hobby - Live Roleplaying (Larp) - that both brought us to performing with fire. There it was where we also discovered our love to design and make constumes. Until we met in 2010, we were part of different fire groups. 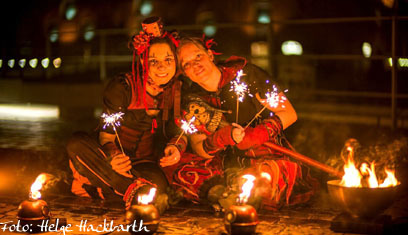 Since our paths crossed we perform together as Duo Flammenspuk - doing fire shows, artistics and walking act in costumes. Our enthusiasm for perfomances on stage and our joy in learning new things we pass on to children in circus lessons at schools and sports clubs.